Tests—especially high-stakes assessments—can strike fear into the hearts of all learners. To succeed during test time, kids need to master so much more than the academic content: they also need to manage anxiety, develop memory strategies, use time management skills, and communicate their knowledge with skill and logic. That’s a tall order for all students, with and without disabilities. 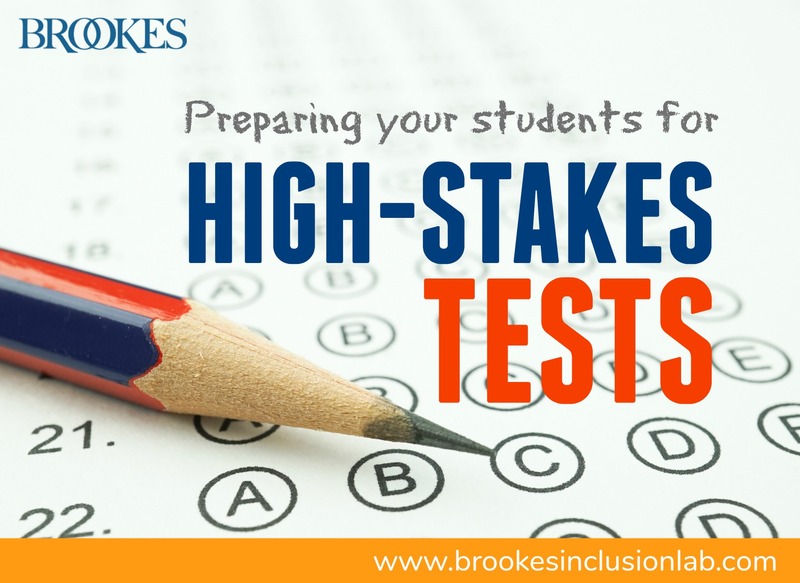 While high-stakes tests will never be a favorite activity for most students, you can help them approach test time with greater confidence and skill. Starting at the beginning of your school year, plan on explicitly teaching your students test-taking skills and preparing them academically and emotionally for high-stakes testing. Today’s post—excerpted and adapted from Launching a Career in Special Education by Potts & Howard—gives you a few starter strategies for teaching students with and without disabilities the skills they need to approach test days with a little less dread. …try opening your class with quick “warm-ups” that use questions similar to the ones that will be on the test. Ask your students to answer two multiple-choice questions, review the correct answers with them, and ask students to explain how they arrived at the correct answers. Hearing the explanation will help students learn how to eliminate other choices to select the correct answer. …try a timed trial. Assign your students a worksheet or paragraph essay and have them practice completing it within a time frame. If some of your students have an extended time accommodation, they can still participate—all students should practice their time management skills so they can become more effective test takers. Students with extended time accommodations can be granted extended time during the timed trial (or you can consider not grading the trial when the student isn’t using the extended time accommodation). …give them the formula for success. All students should be explicitly taught how to write a formula paragraph with an opening statement, supporting information, and conclusion. Give students examples, and then provide them with many opportunities to practice formula paragraphs using a variety of writing prompts. You can try this activity as a warm-up at the beginning of class, or make it a journal activity at the end of your class period. …connect students with supports. Test anxiety can be a major concern, especially for students with learning disabilities or emotional and behavioral disabilities. Ask the school counseling department or school psychologist what resources they may be able to offer. Some school counselors can teach anxiety management skills to all students, including students with disabilities. Students should learn a few specific skills for containing anxiety on test day, such as changing their breathing to help soothe themselves. …teach a “test mindset.” Emphasize the importance of studying efficiently and getting a good night’s sleep the day before a test. Be sure students know that all-nighters and “cram sessions”—while tempting—are not their friend! Do an IEP check. At least 1 month before the test, start looking through your students’ IEPs. Make a list of the accommodations that each of your students is required to have access to on upcoming tests. Consult with other teachers. Do your students’ other teachers use the accommodations? Do the accommodations seem to be helping the students’ performance? This is valuable information that will help you evaluate how effective the accommodations are (and make adjustments if needed). Evaluate unused accommodations. If a student isn’t using an allowed accommodation, do some investigating and find out why. If you find that the student is performing well without the accommodation or is refusing to use it and can’t be convinced otherwise, hold a meeting to remove the accommodation from the IEP. Otherwise, the test proctor may encourage the student to use an accommodation the student doesn’t need or won’t use, which will only increase everyone’s anxiety. Provide a list to the testing coordinator. When you’re sure that your students’ IEPs reflect the accommodations they need and will use, draw up a comprehensive, easy-to-read list and give it to the on-site testing coordinator who will ensure that everyone has what they need on test day. Check in before the test day to see if the testing coordinator has any questions and to ensure that IEP requirements will be met. Follow reporting requirements. Does your state have requirements about reporting test accommodations? Find out and be sure that you’re meeting those requirements. Most students (and teachers!) don’t look forward to high-stakes testing—but with the right supports and strategies, kids can approach test day with a little less trepidation. Do you have a favorite strategy for helping students manage test anxiety or prepping them for an important assessment? Add it in the comments section below! By Elizabeth A. Potts, Ph.D., & Lori A. Howard, Ph.D. 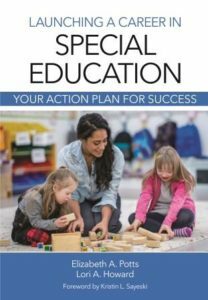 Developed by two special education experts with decades of experience, this how-to book gives you a complete action plan for on-the-job success—from managing everyday details like paperwork and classroom routines to mastering big-picture strategies for behavior management, collaboration, and assessment. A great quick-start guide for novice teachers!